If you have created a new table, dimension or description style you might want to use it in another drawing so how do you copy it from one file to another? Step 1. Open the drawing you need copy the setting into. Step 2. 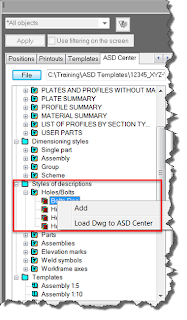 Select the ASD Centre Tab in the Object Inspector. Step 3. 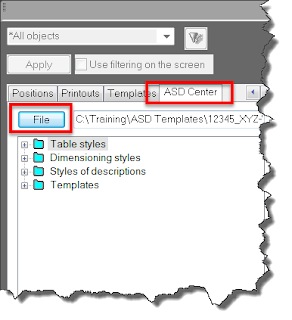 Select the File from ASD Centre Tab in the Object Inspector and locate the drawing you wish to copy setting from. Step 4. Using the plus expand the headings and select the style(s) you wish to copy, right-click and select Add to add them to the current drawing. 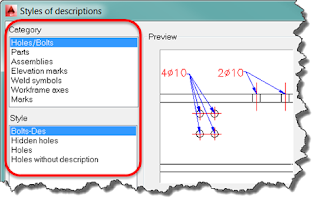 If you then go to the ASD – Drawings Tab > Settings Panel on the Ribbon, then select the style you have just copied in. For example I copied in a description style called Bolts-Des under the category Holes/Bolts. Please Note: If you copy in a style with the same name, it won’t overwrite the existing one. It will put a number after name. for example Holes, it will name it Holes0.